Prepare to be amazed with British Columbia’s capital city, Victoria. Begin and end your day with a ferry ride between the mainland and Vancouver Island. During this fully narrated tour, you will view the Fairmont Empress Hotel, Canada’s oldest Chinatown, and the iconic Legislative Building. Rich with art, history and architecture there is plenty to see and do while exploring Victoria. Visit the world-renowned Butchart Gardens where the flowers are in bloom year round. Discover its numerous fountains, themed garden displays and the breathtaking Sunken Gardens. Start time: Variable depending on time of the year. Hop aboard BC Ferries where you will enjoy the coastlines of the Gulf Islands and wildlife (keep your eyes open for whales, seals, and eagles). Take in the sea breeze from the deck or enjoy the views from your warm seat inside the ferry. Once on Vancouver Island, your guide will drive you straight into the heart of Victoria, while providing commentary about the city’s history and surrounding areas. Spend some time in Victoria’s Inner Harbour, where you will have leisure time to explore everything from artistic totem poles, museums, boutique shops and restaurants along cobblestone streets. 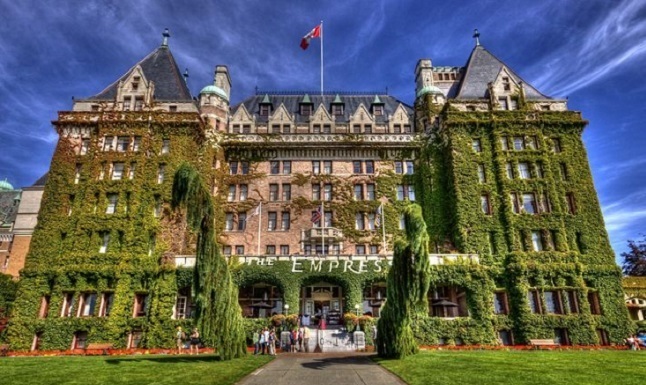 Visit the Fairmont Empress hotel and view the iconic Legislative Buildings. Your guide will be happy to suggest activities and lunch options. Back onboard the bus drive through the countryside arriving at your next stop, a visit to the flawless Butchart Gardens, showing 55 acres of floral displays. Due to its mild climate the gardens are in bloom year round. Stroll along meandering paths and view the impressive Sunken Garden. Don’t forget your camera! Your tour concludes with a relaxing return sailing aboard BC Ferries. Book your Victoria & Butchart Gardens Tour with Alpine North Limousines Today!